My father is safe, but he’s been evacuated—indefinitely—so he’s sleeping in my bed. I’m sleeping in the attic. “It’s twenty years, I’ve been looking out on Notre Dame. That building is completely part of my life,” he said, before falling asleep. In the crowd, as we watched it burn, someone tried to rally spirits by singing the Marseillaise. I joined him. We got to “L’étendard sanglant est levé,” and someone said, “Bah oui,” and then we both fell silent. There is some good news: they have saved the structure. The North tower has been saved. There is bad: a fireman has been severely injured. The roof has almost entirely been destroyed. The upper rose windows have melted. I tried to describe what I was seeing to my father, but couldn’t. “We use the word ‘cathedral’ as a metaphor for everything,” I said. “What metaphor do you use for this?” I pointed at the cathedral in flames. “It’s not a good omen,” he said. My best to you and your father too Claire. I just hope the poor fireman survives. The church after all will endure now. My favourite part of my trip in 2017 was the Rose windows. A testament to the beauty of the Middle Ages and lies of so many “clever” historians. I will miss them. I’m thankful that you two are okay, but just devastated at the loss. As I watched the conflagration, I found myself thinking many thoughts, but one of them was, “I wonder if Claire will give us her view from Paris.” I’m so glad you did. 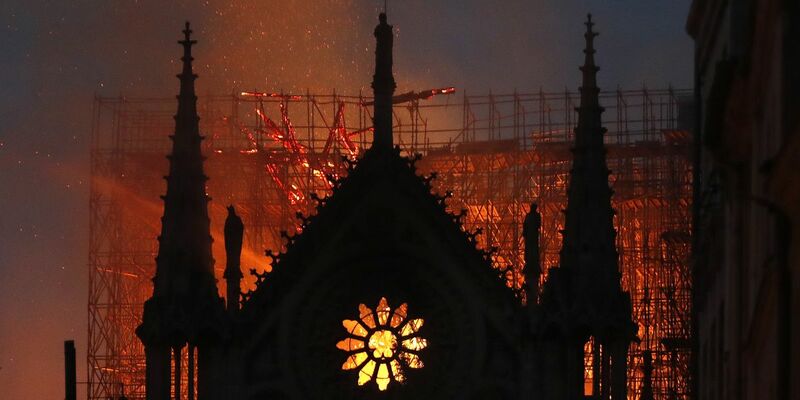 Another thought was, “History lasts, but the things of history do not.” Notre Dame will – it must – be rebuilt; there are still craftsmen who are capable of rebuilding it. And 800 or 900 years from now, people will marvel at the ingenuity of those ancient people in the 21st century who were able to resurrect this marvelous cathedral. Thank you for the update. This is devastating. Fr. Z has two recordings of the bells at Notre Dame. When will they be heard again? 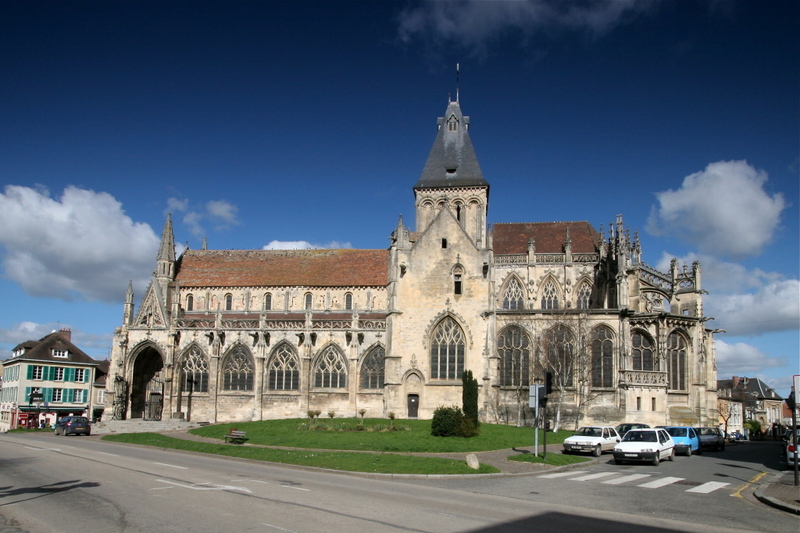 The cathedral Sainte-Croix in Orleans, tolls funeral bells for Notre-Dame. Glad your family is safe. Sad for Paris and France. Hopefully they can rebuild. I must say I found the news of thos tragedy absolutely shocking. I spent the better part of today listening to a book on tape, working inside a sterile hood manipulating cells. Trying to finish experiments before I take of on a vacation to visit my brother so as to spend Easter with my nieces and family. I log onto my phone to check work emails and them at around 2PM I come to Ricochet to see this at the top of the page. It is a surreal feeling. An iconic piece of history engulfed in flames. The shared heritage of humanity crumbling before my very eyes. What a wicked turn of fate. I formally dont believe in omens, but informally I share your father’s assessment; an ill omen indeed. But of what? To think that it survived so long and so much and in one afternoon it was nearly all destroyed. Amplifying what Claire wrote, it appears that the interior is relatively intact. Here’s hoping that is enough structural integrity that this does not change. Remember that all but one of the bells were removed and melted down during the French Revolution to make cannons and, yes, guillotines. They all bear the names of Saints and have been inscribed with prayers. They are “baptized” in a sense with a special anointing and blessing. The 13-ton bell that survived the revolution is named Emanuel, which of course means God is With Us. The last bell to be restored was only in 2013. This is a nice article describing them. 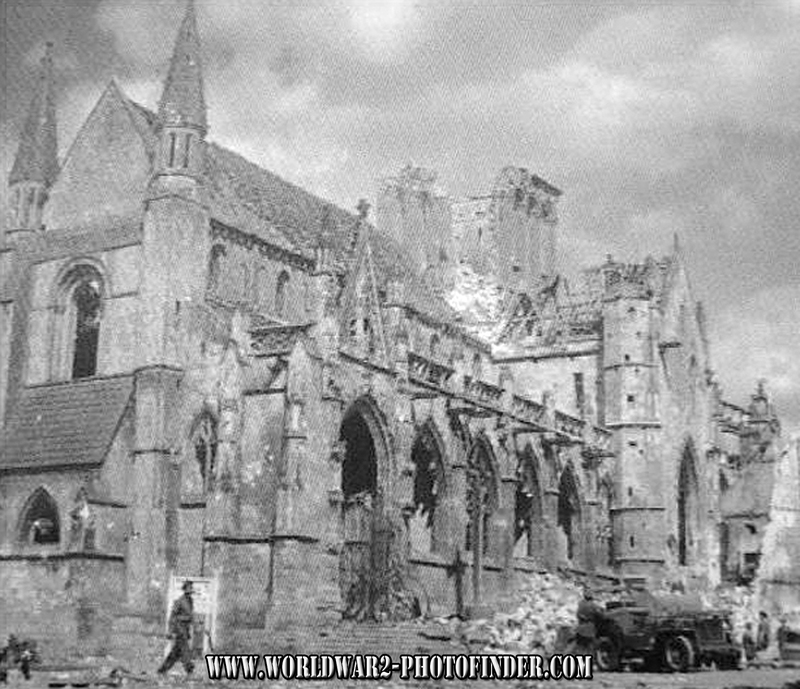 Back when the Cathedral was built, they would have seen this conflagration as a physical sign of the state of the Faith in France – the burnt out hulk of the Cathedral representing the burnt out remains of the Body of Christ in France. Virtually no one takes the Roman Catholic faith seriously in France anymore. 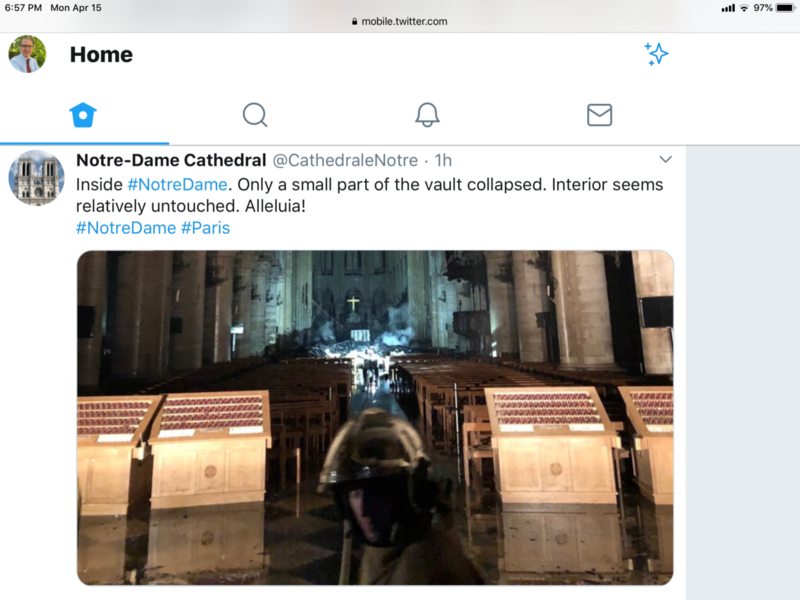 Yes, with modern technology we can resurrect the Cathedral to even greater physical glory than the original structure, as the secular President of France has promised to do. Apparently it didn’t occur to anyone to consult the Bishop of Paris – do people even know that a Cathedral is by definition the seat of a bishop? But that’s entirely appropriate as the Cathedral now is relevant for purely historical and aesthetic reasons rather than any religious significance. Would that the Faith in France could be resurrected so easily, but no one is interested in that. Frankly, I’d rather the building remain a hulk as a reminder of what has been lost – like the Parthenon – than rebuilt as Cathedral 2.0 that mimics the signs of the Holy Faith that inspired it, and gave hope to Europe throughout the Middle Ages, yet without any of the substance. It seems, well, disrespectful. Especially as they will probably finish rebuilding it just in time for it to become a mosque. Thank you all for this update and Claire. Do they have any information on how the fire started and when? I have been out of the loop today. Very sad comment but so much discernment – I felt the same way. I thought of you today, Claire, when I heard this tragic news. I’m so happy your father is safe, in your care. I’m so sorry for this loss to humanity. Those stones, in their magnificent formations, and those beautiful windows merely served to give form to the humanity, heart, spirit, and ingenuity that lives on…in humanity, all these thousands of years. Still, it is a bitter, tragic loss, but we will soldier on. That is what we do. These stones and windows were bought and built by believers, in reverence to a God who is no longer honored by the people of Paris, let alone France. Were the structure to be dedicated to the deity actually worshiped by a substantial population in the area, it would indeed be a mosque, not a church. That’s how I feel. It’s like a weight on your chest. Grateful you and your father are safe, Claire. I’ve really missed your posts on Ricochet, by the way. I wonder if all those rafters slow the fire down at all. I’m sorry to bring this up but this is where my mind goes. As the fire is put out, too many questions remain. Is there retrievable surveillance video in and around the structure? Will it be disclosed to the public at some point? Where did the fire begin? Was it started in one location or more than one? Has there been a detection of a chemical accelerant? Or something that workmen left unattended that could have ignited? If some chemical substance was left unattended, is that standard protocol for renovation workers? Were workmen on scene at the outbreak of the fire and if so, have they reported any unusual activity or persons in areas where unauthorized persons are not permitted to go? Was there monitored, and as of yet undisclosed, chatter from known terrorist cells in France days or weeks prior? Does this fit a pattern of other Catholic churches in France that have recently been vandalized? What were the reasons the French prosecutors have, at the moment, ruled out arson? Is it because they have answers to some or all of the questions above? If they do, that would seem to be some incredibly fast investigative work. My goodness, but you have a suspicious mind! It’s almost as if you think that fifteen French churches burned since February isn’t sheer coincidence! 9. Have all the renovation workmen been accounted for and questioned? What are there backgrounds? Why characterize the fire as “accidental” before all the relevant facts are in? In 1911, an Italian carpenter working in the Louvre was commissioned to remove the Mona Lisa from its frame. Da Vinci painted the portrait on a piece of wood. The carpenter pried it out of its frame in the middle of the night, tucked the painting under his overcoat and walked right out of the museum. The painting was missing for over two years before it was recovered by police in Italy when the carpenter attempted to sell it to the Uffizi gallery. There’s much more to that fascinating story but one wonders whether the French police are tracking down all of the workers on the renovation project as we speak. Okay, one more question, if there are surveillance cameras on site are they monitored by police authorities or a hired security firm off-site? When it comes to establishing a cult of Reason and demonizing the Church, the French have a 250-year head start on the rest of Western Civ. I don’t think the loss of Notre Dame would have awakened anything in the secular breast. I get the sense that they are proud of these places because they regard the art as a transcendent humanist achievement. It may have been inspired by superstition, but now that superstition has been banished, the humanism behind the accomplishments can be appreciated, divorced from its mumbo-jumboism. Perhaps so. But the buildings that came from post-war era are generally anti-human works of monolithic oppressiveness or ahistorical fancy. Odd how that happens. Humans can be remarkable, but we’re a mixed bag, and when you yank away the chocks the wheels roll in directions unanticipated. Of all my memories of Paris, the one that sticks is standing in the small square by the Holocaust museum, looking at a plaque that described how the children were assembled to be sent to the camps. Two men with automatic weapons stood by the museum in watchful poses. Because, well, you know. A lovely piano melody drifted from an open window. The pianist seemed to be improvising. The melody would turn discordant, and he would stop. Then he would try again. I recently had this painting on my desktop screen. 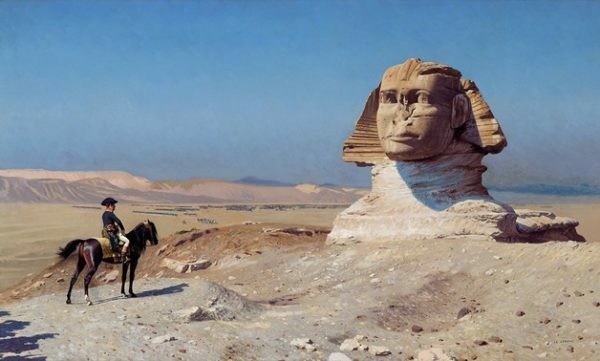 Something once important to a civilization so long ago, half buried at the time of the French in Egypt. Two men with automatic weapons stood by the museum in watchful poses. Because, well, you know. Claire Berlinski, Ed. : To walk across the Seine and not see the spire is devastating. My wife and I feel the same way whenever we watch a movie that shows the Twin Towers. We both sigh as we keep watching . . .
My goodness, but you have a suspicious mind! As do I. The first thing that came to my mind was “Muslim terrorists” . . . If it’s true and discovered that it was, I think we’ll never know. People in a position to tell the public won’t, out of fear of a “backlash”.